California has only one rock lizard: Banded Rock Lizard Petrosaurus mearnsi (all photos on this page). It occurs only in rocky gorges on the eastern (desert) side of the peninsular range from San Gorgonio Pass, Riverside Co., south into northern Baja California. All these photos are of just one individual that Dan Singer first spotted in Borrego-Palm Canyon, Anza Borrego SP, San Diego Co. 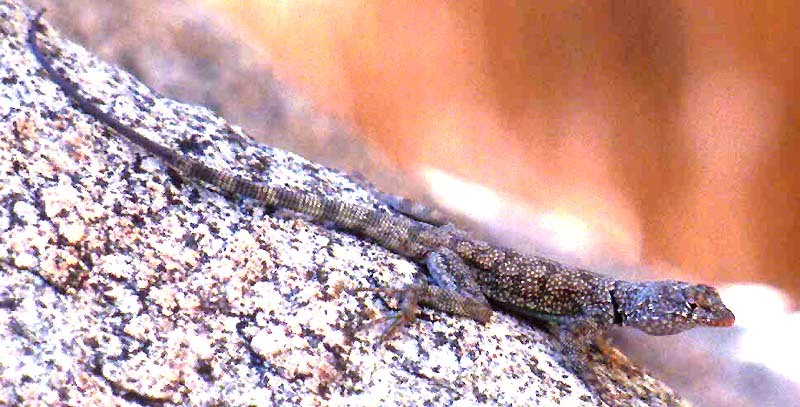 There are two other species of rock lizard on the Baja California peninsula (according to Stebbins 2003). I thought the Banded Rock Lizard (sometimes called "Mearn's Rock Lizard" to distinguish it from another, more southern, subspecies) was a really delightful lizard. The formal literature gives lizard lengths as snout to vent only (~3-4.5 in in this species per Stebbins 2003) but the tail is quite long. I think the whole lizard might be a foot in total length. The legs, toes, and tail are all very long and flattened to move about the huge boulders it inhabits. 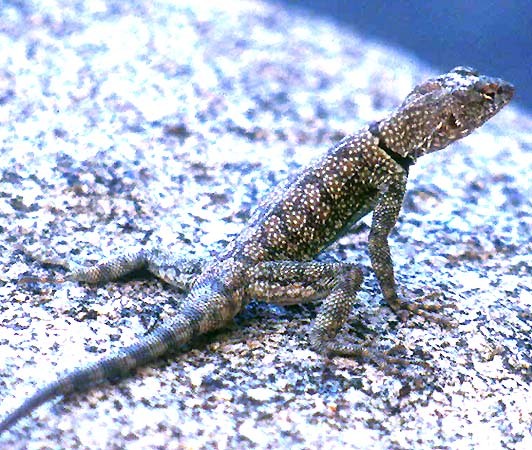 Sanborn (1994) describes it this way: "By keeping all four legs outstretched, the banded rock lizard can move swiftly across the surface of a rock, including the undersides and vertical sides of large boulders. As the lizard pulls its limbs toward its body, the sharp, slender claws on its toes grip the rough surface. In this way, it can hold its body and limbs much closer to the rock that other rock-dwelling lizards can. The tail seems to act as a counterbalance, and as the lizard moves across rocky surfaces, it appears to waddle." He also says that "these lizards seem to be very curious and can be approached rather closely. When frightened, they retreat to a narrow crevice or dart to the other side of the boulder." Our experience was similar. By moving slowly, we could approach closely, but once the lizard got concerned, it skittered away to the far side of the boulder very quickly! John Sullivan's "Wild Herps" web site with numerous photos and stories of finding lizards (including this one), plus a wonderful review of the available literature. A very fine resource for southern California is Sherburn Sanborn's (1994) Lizard-Watching Guide. Taxonomy and English names are discussed in Crother et al. (2001). The Stebbins' (1966, 1985, 2003) field guides — now in a greatly revised 3rd ed. — provide the standard identification material. Crother, B.I., chair. 2001. Scientific and standard English names of amphibians and reptiles of North America north of Mexico, with comments regarding confidence in our understanding. Committee of Standard English and Scientific Names, Society for the Study of Amphibians and Reptiles, Herpetological Circular 29 (as supplemented in Herp. Review 32: 152-153). Sanborn, S.R. 1994. The Lizard-Watching Guide. Loraine Press, Salt Lake City, UT. Stebbins, R.C. 1966. A Field Guide to Western Reptiles and Amphibians. Houghton Mifflin, Boston. Stebbins, R.C. 1985. A Field Guide to Western Reptiles and Amphibians. 2d ed. Houghton Mifflin, Boston. Stebbins, R.C. 2003. A Field Guide to Western Reptiles and Amphibians. 3d ed. Houghton Mifflin, Boston.